With my final project finished and assessed, my focus now turns to the upcoming MA Degree Show. 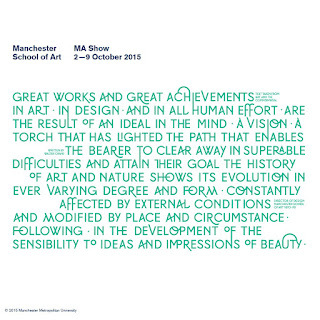 I will be exhibiting my two final project pieces, Penumbra and Keeping Time, along side my contemporaries from a host of different disciplines at Manchester School of Art (part of Manchester Metropolitan University) from 2nd - 9th October. If you are interested in attending the show, you can find the details by clicking on the image below.